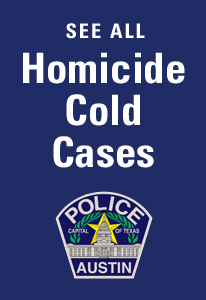 The Austin Police Homicide Cold Case/Missing Persons Unit consists of 7 detectives and 1 sergeant. The unit is tasked with following all leads and evidence in unsolved cold case investigations. There is NO statute of limitations on murder. Therefore, Homicide investigators know that justice is owed not only to the deceased victim, but to family and friends left behind. Currently, the Cold Case/Missing Persons Unit has a total of 162 unsolved cases dating back to the 1960s. Thirty of these cases are Missing Persons. The review process includes evaluation of cases, suggestions for further investigation and review of current forensic and computer technologies such as DNA and AFIS (Automated Fingerprint Identification System) and other investigative techniques utilized by detectives. Please review the Cold Case/Missing Persons summaries and if you have any information pertaining to any of these cases, please contact the Austin Police Department Homicide Tipline at (512) 477-3588, Crimestoppers at (512) 472-TIPS or by email.